This week marks the 20th anniversary of the passing of DCI Hall of Fame member Steve Brubaker, who lost his battle with brain cancer on January 28, 1993. Beginning his drum corps career in 1977 as a color guard member of Pennsylvania's Reading Buccaneers, a job transfer in 1978 brought Brubaker to Chicago where he started his tenure with the Cavaliers. First working with the organization's cadet corps, he soon became an integral part of the Cavaliers' instructional staff—both the summer drum corps and the winter color guard. Serving as Cavaliers visual designer in full or in part from 1982 until 1991, he wrote a bevy of intricate drill formations and passages. As the first to march the "Green Machine" through breakneck kaleidoscopic forms, he formed the cornerstone of the corps' identity today. Perhaps one of Brubaker's oft overlooked but most important contributions to the marching arts, was his ability to seamlessly stage and integrate the color guard and percussion sections into the overall design of drum corps productions. 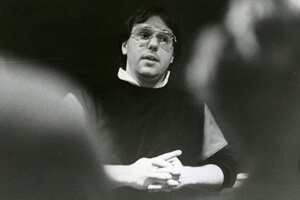 "He inspired and educated many of us in the aspects of musical and transitional design, as well as interpersonal communication skills," former Cavaliers Director Jeff Fiedler wrote on the 10th anniversary of Brubaker's passing in 2003. "He was instrumental in elevating the Cavaliers, the 'dot-to-dot system,' and the vision of what the Cavaliers could be." With the help of Brubaker's visual design, the Cavaliers began to reestablish themselves as a competitive force in the drum corps activity. Though falling ill in 1991, he would have the opportunity to see the payoff as the Cavaliers won their very first DCI World Championship in 1992. 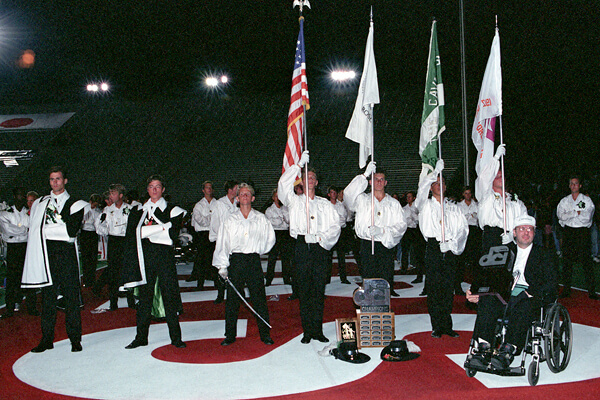 In a wheelchair, Brubaker proudly stood by the corps on the field at Camp Randall Stadium during the finale of the World Championship Finals. Steve Brubaker at the 1992 DCI World Championship Finals in Madison, Wis.
Before his passing in 1993, Brubaker kept a number of drill writers under his watchful eye. Greg Poklacki, who designed in tandem with him for the Cavaliers in 1990 and 1991, was tapped as an immediate successor. One of Brubaker's most notable apprentices is DCI Hall of Fame member Michael Gaines, who served as visual designer during the Cavaliers' most successful decade in the 2000s. To this day, Brubaker continues to influence and inspire countless others. "For me, taking a look at Steve's 'dots' is like peering into the Sistine Chapel of drill writing—perfection," Santa Clara Vanguard Drill Designer Pete Weber said. "It's hard not to get excited about how the forms always work out mathematically perfect, or the way that it 'looks' simple, but upon further examination makes me marvel at the brilliance of its complexity melded with a natural flow. "Even the geometric segments have a Mozartian quality about them—mathematically perfect, yet lyrical in substance. The way he carved out 'shapes and figures' is a rarity in today's computer-aided style of designing." In addition to drum corps, Brubaker's body of work has long been an influence in both the marching band and winter color guard activities. He is a member of the Winter Guard International Hall of Fame, and having designed for some of the country's top marching bands, he has been honored as the namesake of the Best Visual Performance Award given out each year at the Bands of America Grand National Championship. Brubaker was inducted into the DCI Hall of Fame in 1992.